... I'm going to let it shine! I am gloating over the paper today, where it tells how we are lighting up our Peace Bridge. You can read about it and see the Peace Bridge lit up here. Oops, sorry! 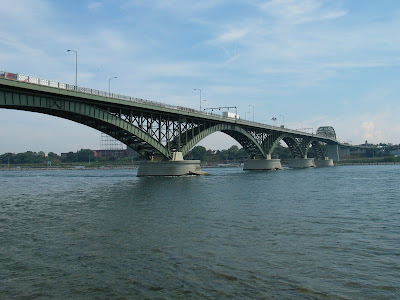 That was the memorable and dramatic story about my most recent crossing over the Peace Bridge. You can read The Buffalo News' story here. The reason I am crowing about this is that I proposed a few years ago in the paper that we do this, that we light up the Peace Bridge. I wrote a whole column on it. It seemed to go nowhere so I just gave up on it. My job was not set up in a way that would permit me to keep beating the drum for the idea, which is what you have to do in Buffalo, or probably anyplace, if you want to get anything done. But now lo, it has come to pass! This is great for Buffalo and it is a triumph of common sense. Here we are with this historic bridge and it's a pretty bridge, too. They certainly thought so in 1927 when it went up and the Prince of Wales came to the ribbon cutting. 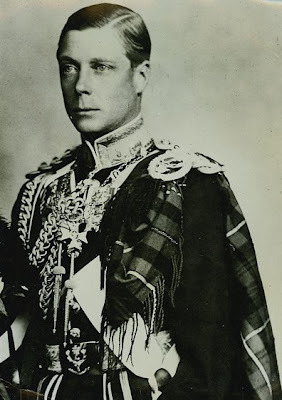 And that was back when the Prince of Wales was a very glamorous figure, not someone who went around eating brown rice and quoting the Dalai Lama. Here is a picture of Edward, Prince of Wales, who christened our beautiful Peace Bridge. 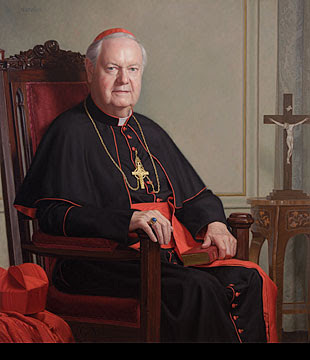 What about Edward, Cardinal Egan? Remember when I interviewed him for my book and Howard made that goofy video? Back to the Peace Bridge. I always wondered how it came to be considered ugly. It is a kind of mob mentality. One person says something, another person says something, and before long, everyone is howling for "the eyesore" to come down. That is a word slugs and schufts love, "eyesore." There is one way to deal with something everyone saying is ugly and that is to shine lights on it. Play it up. We do that an voila! Signature bridge! Howard has a philosophy that goes, turn your weakness into your strength. I am even applying that to my book. At one time, Leonard Pennario was not only hailed as one of the world's top pianists, but he was a household name. By the time I met him, though, he was pretty much forgotten. You would think that would be bad news. But I like to emphasize it! It contributes drama and humanity. This pianist who was forgotten suddenly appearing, out of the ether. That is part of what makes this story beautiful to me. I shine a light on it. Just like we shine a light on our Peace Bridge! This is great and I would like to see the Skyway receive a lighting system too. That is an awesome bridge! And it has so much history and distinction. BTW, Howard's video was cool! It looked so homely and nice! Larry, thanks for the compliments... you are the video master! It is a nice span. Ever see the HUGE Mexican flag that flies in Cancun? We need a Canadian and an American flag that size attached to the Peace Bridge. That's all the signature we need. "Shining the light" on Leonard Pennario is the main ingredient here, lol! How awesome is that! And how awesome is that lovely analogy! I too have always liked the look of the Peace bridge (perhaps replace eyesore with sight for sore eyes) However I am a member of IDA (International Dark Skies) and was disturbed to see some of the leds will face upward. Many cities are becoming more enlightened (no pun intended) about light pollution. Lighting should be necessary and used only to ... Read Morelight what needs lighting. We are only now learning of the detriment of our everlastingly lit environment to plants and animals. Sorry, this is such a "soap box" venue. Sure wish the PBA would spend the money on fixing up the homes I am forced to look at everyday from my back door which faces Busti Ave. which has been left in deplorable conditions for 14 years (they own) instead of spending the money on lights! Lights are nice, but ........ The PBA doesn't care about the health of the people (especially children... Read More) 25,000 who live on the West Side and a huge percentage suffer from asthma from the diesel emissions. The PBA doesn't care about the City of Buffalo or any of us! They have been telling lies for over 20 years! Don't believe anything the Buffalo News prints about the PBA.